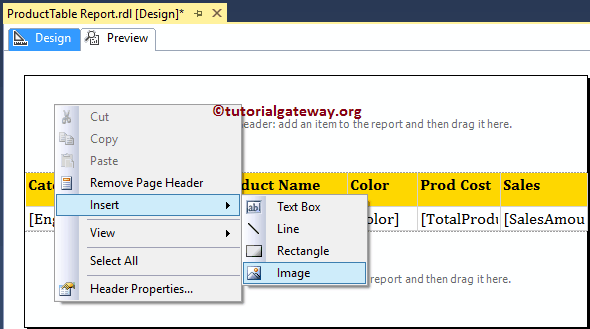 In this article, we will show you, How to add Headers and Footers to SSRS Report. 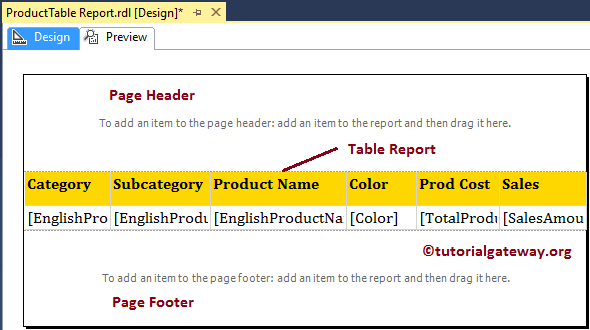 Or, How to add or remove Page Headers and Footers in SSRS Report. 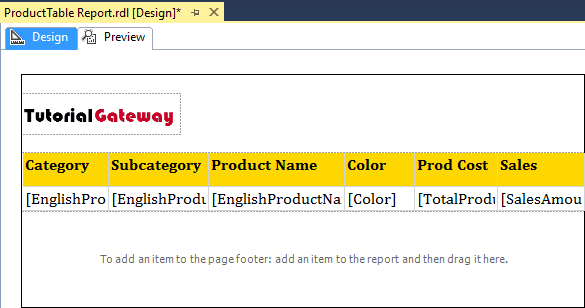 Both SSRS Headers and Footers will repeat in each and every page generated by SSRS Report. These are very helpful to place the Report Title, Company Logo, Company Address, Report Generated Time, Page Numbers etc. 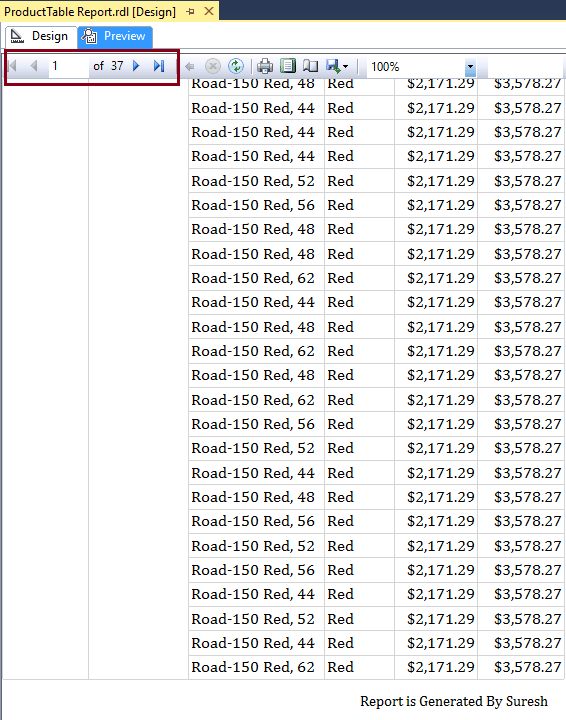 For this example, We are going to use the below-shown DataSet. Please refer to Shared Data Source and Dataset articles to understand the steps involved in creating Shared Data Source and Dataset that we used for this report. 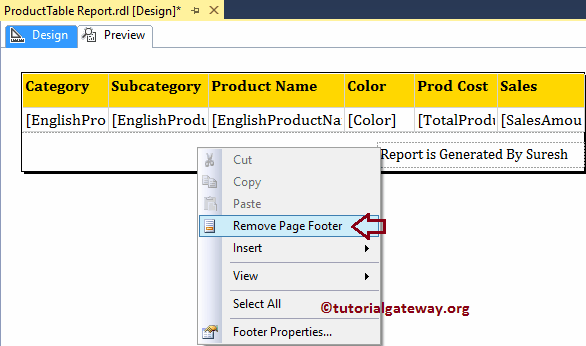 To explain the steps involved in add or remove Page Headers and Footers in SSRS Report, We are going to use below shown report. Please refer Table Report, Format Table Report articles to understand the creation, formatting table reports, and refer Grouping in Table Report article for Grouping techniques. 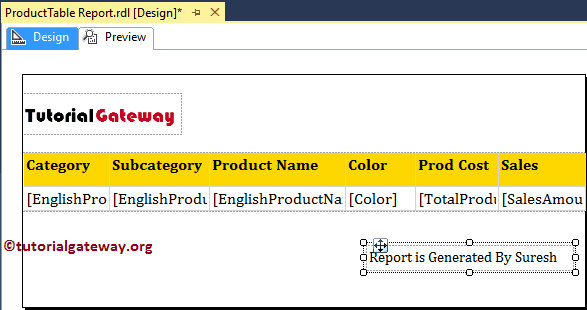 In order to add the SSRS Report Headers, or SSRS Page Headers, right-click on the empty space in report designer to open the context menu. 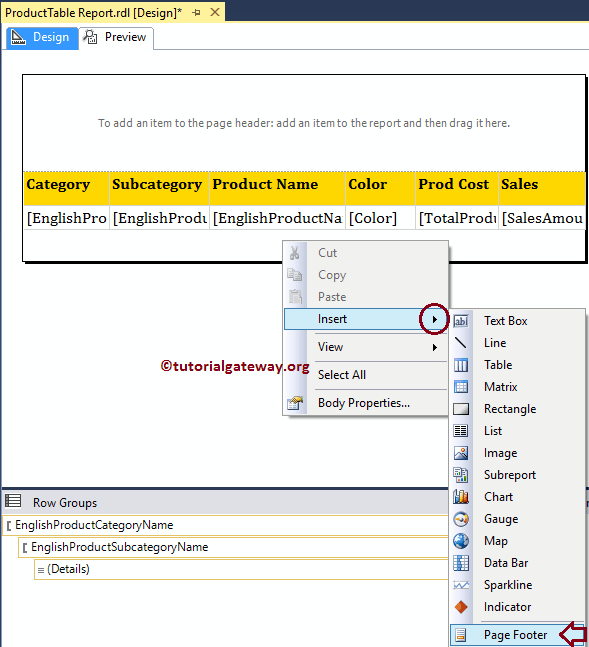 From the context menu, please select the Insert -> Page Header option as we shown below. 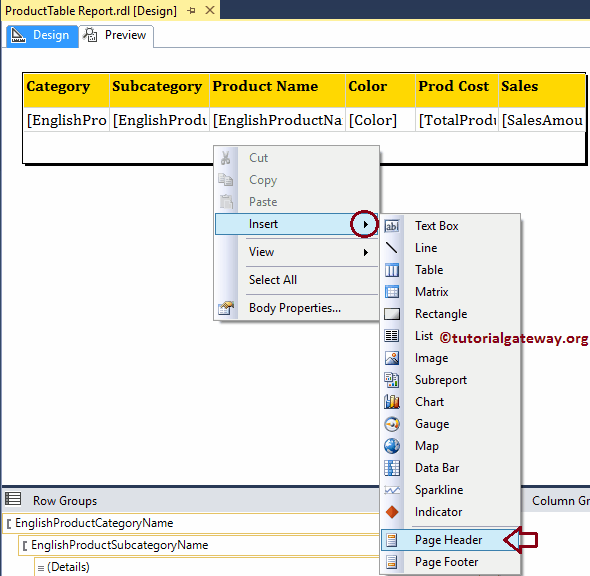 To add the SSRS Report footer, or SSRS page Footer, right-click on the empty space around the table report in report designer will open the context menu. 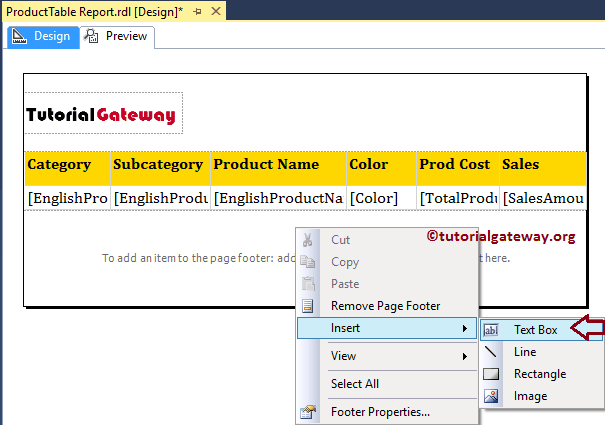 From the context menu, please select the Insert -> Page Footer option as we shown below. For the demonstration purpose, we will add our logo to the Page Header. And to do so, please right-click on the Page Header, and select the Image option from the context menu as we shown below. Now you can see the Logo, and this logo will be repeated in each and every Page. Let me add a text box with random data to demonstrate the Page footer advantages. 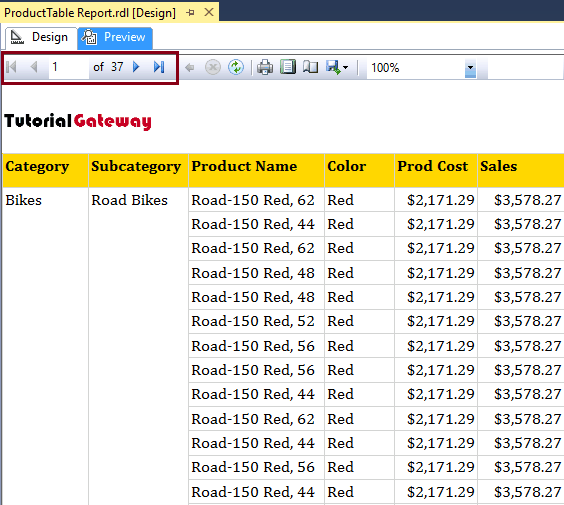 It is very easy to remove Headers and Footers on SSRS Report. 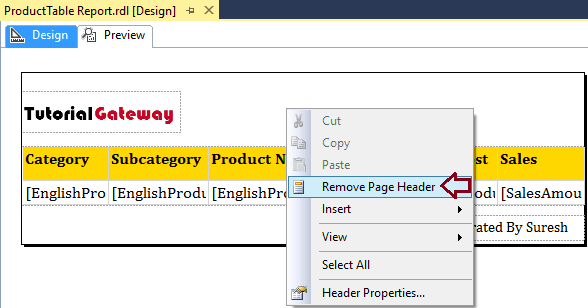 Please right-click on the Page Header, and select the Remove Page Header option from the context menu as we shown below. In order to remove the Page Footer, Please right click on the Page Footer. Next, select the Remove Page Footer option from the menu as we shown below.